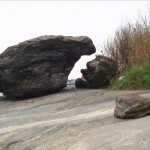 Bronx Council for Environmental Quality » Blog Archive » Conversation…….. Or a tale of two rocks. Hee! It does look like the rocks are talking to each other! Great point of view! This really made me smile. Great photo! it’s artistic as well as whimsical to suggest that they are talking with each other. Great eye to see this. Love the title as well. Superb. I can imagine sitting in the sand and chilling out at this spot. Would love this one on my wall.